We care about making you look and feel beautiful. Turn your dream party look into reality. Look absolutely fabulous with flawless hair and makeup at every Party , get a truly unique experience whether it’s for an Asian party, Indian party, glamorous cocktail party, birthday, our team of Artist MUAs can create the perfect Party Hair and Makeup look for you. Your chosen Artist MUA will carry out a Party hair and makeup look, which will compliment your Asian or Indian outfit and is guaranteed to have the WOW factor whatever the Party occasion. Each of our dedicated and highly skilled Team Artist MUAs have been carefully selected. 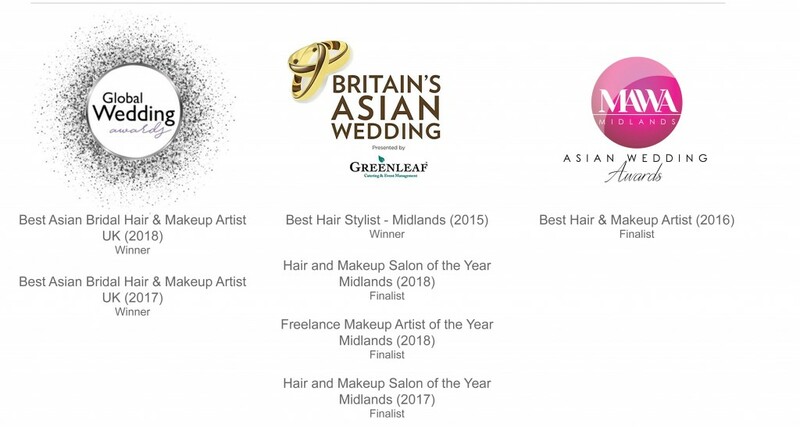 Each member of the team have a true passion for creating flawless Party hair and makeup looks whether its for an Asian or Indian Party and a commitment to delighting their clients. Every Team Artist MUA prides themselves on excellence giving our clients our full commitment, we make it our mission to get to know our clients’ personality and unique style. Our service allows all of our Team Artist MUAs to discuss their desires and concerns, and also to discuss latest trends and fashions to finally create a Party Hair and Makeup style our clients absolutely love. The only distinction between Team Artist MUA levels is the years of experience (typically vary from 5 – 15 years). Be inspired and let them create the magic for any of your occasions. Feel free to call and chat to our Front of House Team who will tell you everything you need to know in order to choose the right Team Artist for you. We travel internationally, however, the primary areas our team covers is the West Midlands, Birmingham, Wolverhampton, Leicester, Walsall, Dudley, Leamington Spa, West Bromwich & Coventry. Our team also cover London and greater London areas for Asian Bridal Hair and Makeup. To book your consultation with the Anu Malhi Team please read the ‘Trial Consultation’ section below. We travel internationally, however, the primary areas our team covers is the West Midlands, Birmingham, Wolverhampton, Leicester, Walsall, Dudley, Leamington Spa, West Bromwich & Coventry. Our team also cover London and greater London areas for Asian Bridal Hair and Makeup. We travel internationally, however, the primary areas our team covers is the West Midlands, Birmingham, Wolverhampton, Leicester, Walsall, Dudley, Leamington Spa, West Bromwich & Coventry. Our team also cover London and greater London areas for Asian Bridal Hair and Makeup.